Warning: Zen Magnets are not children’s toys, and may cause fatal intestinal pinching if swallowed. Read warnings and keep away from face. Don’t leave them around animals, or children who don’t understand this. 72 Zen Magnets, Velvet Sack, and Focus Guide. Free Domestic 3-7 Day Shipping available. Free Priority 2-3 Day Shipping on 3 or more Focus Sets. We usually ship within 24 business hours. Despite what everyone and their TV commercial says, more is not always the key to happiness. 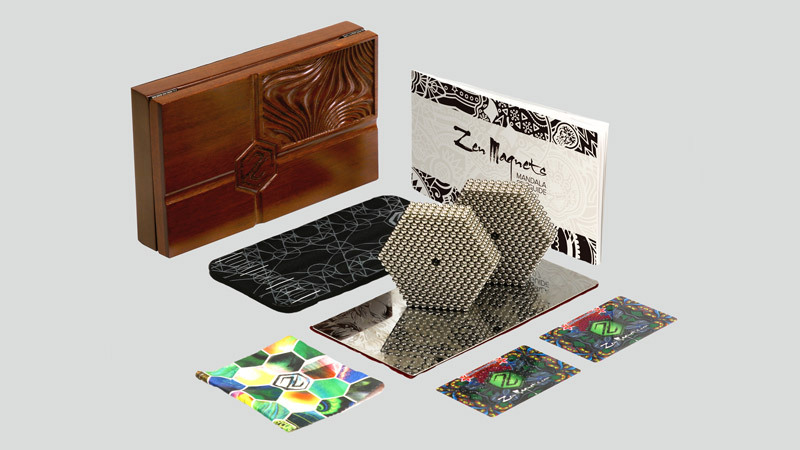 The Focus set consists first and foremost of 72 perfectly precise rare earth magnets, a personal portion of Zen Magnets with massive potential, without ever being overwhelming. When there are less parts to work with, there’s a better chance everything will fall into place. Hidden inside with a velvet bag is the Focus Guide: a collaboration of a dozen artists weaved into a 52 page presentation of 7 tutorials plus 45 challenges for the fingers, eyes and left brain. No tools. No distractions. Just a half hour break from your desk whenever you need – from your ringing phone and relentless pings of email – even if just for the experience of having cold polished metal balls encompass your fingers. If your goal was to make a new shape every day, one full year later you’d find no difficulty avoiding repetition with the Focus set. 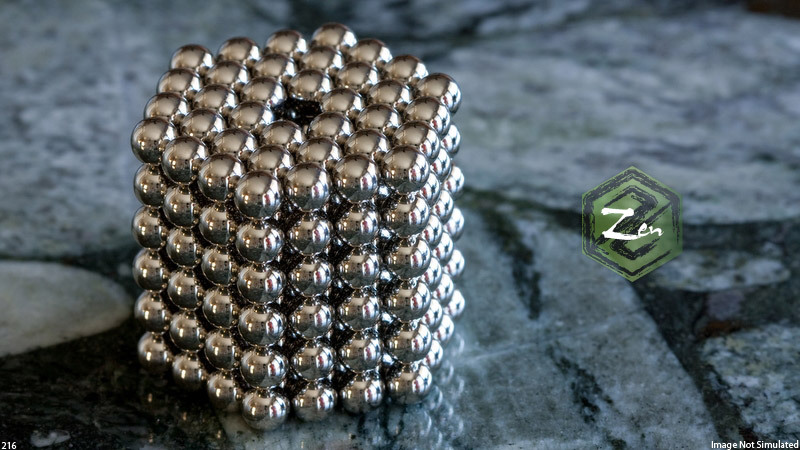 With fewer magnets, it’s not only easier to stumble upon interesting shapes, it’s easier to conceptually develop the techniques that can be scaled to larger structures. 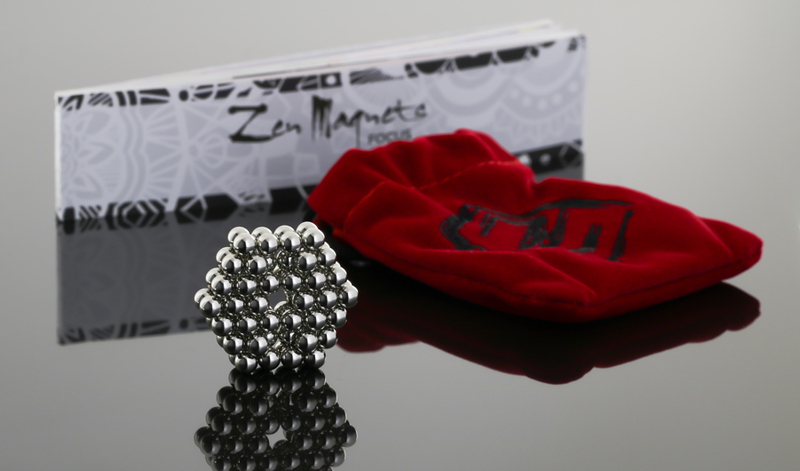 72 Zen Magnets measure 36 cm long in a wrist worthy chain. More than enough to get sentimental with. Don’t feel pressured by anyone telling you that you need more, but don’t be surprised if you come to appreciate more. Mirror coated NiCuNi for longevity and tactility. Ultra tight ±0.01mm diameter tolerances for maximum consistency of use, and lattice rigidity. Perfection unmatched. 1728 magnets, design and build to your desires. 216 Zen Magnets, no filler, no frills.